If you are not familiar with Android Wear, it is a new operating system that Google developed in order to work with the rising market of wearable tech. The Big G announced Android Wear last March, but LG has just unveiled the G Watch, now the very first device of any type to have the new wearable operating system. Dr. Jong-seok Park, the president and CEO of the LG Electronics Mobile Communications Company, stated that the company “wanted a device that would be simple to learn and so intuitive that users wouldn’t even have to think about how to use its features”. A part of these instinctive controls include vocal recognition, which means that users can send text messages or perform searches by simply saying “OK Google”. The G Watch has buttonless controls, and the screen is always on. It can be synced wirelessly via Bluetooth 4.0 for constant updates such as who is calling, incoming texts, as well as music playback. The screen is 1.65 inches with 4GB memory. In addition to all of the above features, the G Watch is set up for IP67, so there is protection from dust and water (water resistant for up to 30 minutes to a depth of one meter). The rumour is that the LG G Watch will be launched in the US on July 7, but there is no news yet on when we will be able to buy everywhere else. The LG G Watch will retail for around £135 ($229 USD and Au$244). 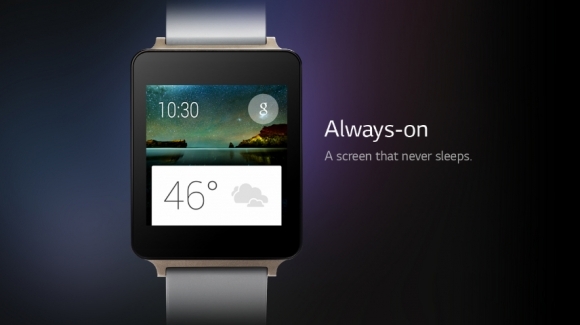 The LG G Watch is available for pre-order on the Google Play Store in two colors: Black Titan and White Gold.